Note that Helpers help time preferences do not change any already assigned shifts - they can just be used by AutoFill if you automatically assign shifts. 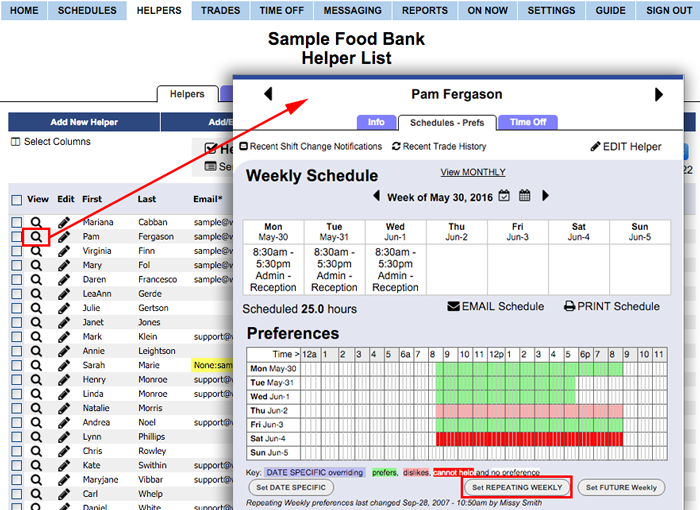 You can use the Analyze feature at any time to compare how the assigned shifts compare to the current help time preferences. Also, the preferences can be useful when finding replacements for shifts. When you click any shift, the Shift Change window will show a list of Helpers who are available to work that shift. Helpers who have set that time to "prefer to help" are listed first so that you will know the best Helpers to work that shift. If you allow your helpers to sign in at WhenToHelp, you can also allow them to set their own Help Time Preferences (prefer and dislike times - you can even let them set their own Cannot Help times) down to 15 minute increments. You can track when the preferences were last updated. To set "prefer to help" times, click the green Paintbrush button and then "paint" over the times you would like to change by pressing the left mouse button and holding until you want to stop painting. You can save the preferences as a "Preference Template" to be used for setting other Helpers. 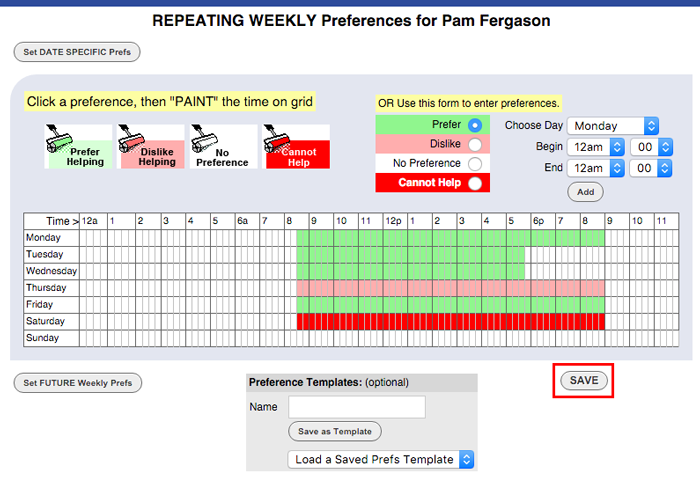 For example, you can quickly add Cannot Help hours for all Helpers who are minors by loading that preference template into each Helper's REPEATING Weekly Preferences grid. Also, if these Repeating Preferences will change on a certain date, click the Set FUTURE Weekly Preferences button to have new preferences go into effect on a certain date. 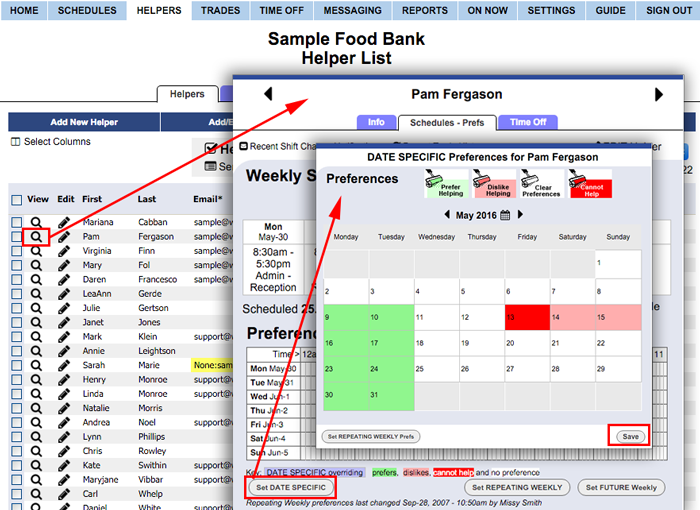 To change any DATE SPECIFIC Preferences - after setting the normal repeating preferences for a helper, you can then set any dates that have different preferences using the Set DATE SPECIFIC Preferences button.